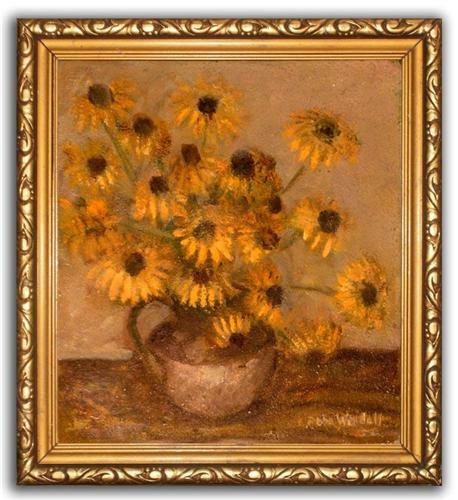 Move over Van Gogh, A. D. Woodall's daisies will give your sunflowers a run for their money. At least I think that they are daisies (see last pic). Loads of wonderful gutsy impasto brush work; and a warmth of colour that will have you turning the central heating down. This is estimated at '70s but may be earlier, check out the old iron 'blacksmiths nails' holding the painting in the frame (penultimate pic). The frame is very much in keeping and in good condition - so straight out of the box and on to the wall.